Artyard Handmade at Artyard020 8878 1336work Craft CentreArtyard Handmade is an independent studio offering art and craft workshops for adults and children. Courses range from drawing and painting, sewing, mosaic, print workshops to a papier mache masterclass. People of all ages are welcome to come in and try something different, learn a new skill and leave inspired to go on creating at home. Also on offer are parties for children, hen parties, corporate occasions and special events. 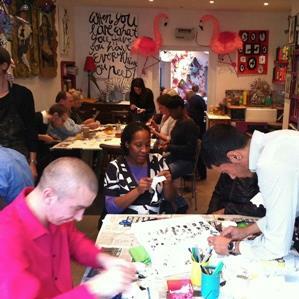 Artyard Handmade is an independent studio offering art and craft workshops for adults and children. Courses range from drawing and painting, sewing, mosaic, print workshops to a papier mache masterclass. People of all ages are welcome to come in and try something different, learn a new skill and leave inspired to go on creating at home.